Rob may no longer be with us but it's Friday and that still means a Product Post! How's it going, everyone? It's Friday and as always that means it's time for your Friday Product Post. We've changed a few things up with the studio - changes that we think you are all going to love. Let's check it out and see what we have for you this week! The wall is back! Now onto your new products. 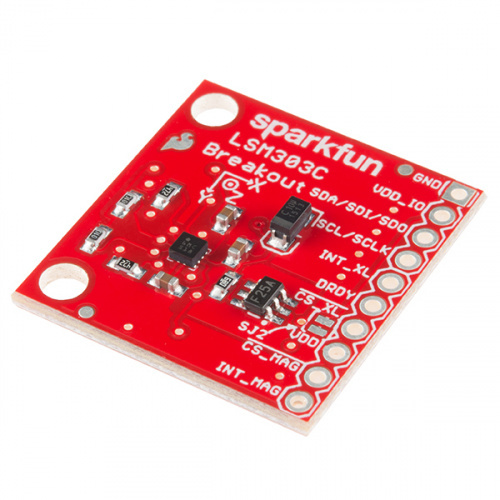 The LSM303C is a 6 Degrees of Freedom (6DOF) inertial measurement unit (IMU) in a single package, specifically developed as an eCompass device. 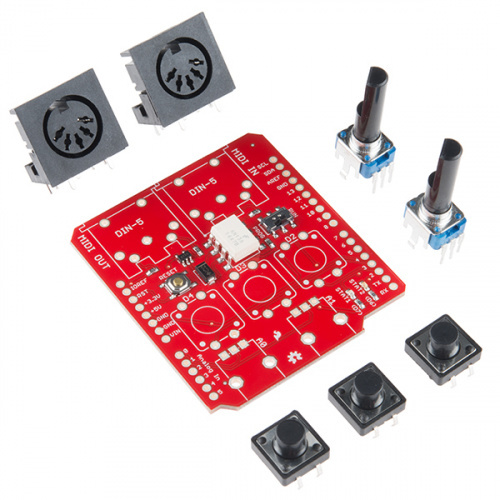 Due to the IC housing a 3-axis accelerometer and a 3-axis magnetometer, combined with its low cost, the LSM303C was perfect for us to create this small breakout board just for you! Each LSM303C Breakout has been designed to be super-flexible and can be configured specifically for many applications. The LSM303C Breakout can be configured to generate an interrupt signal for free-fall, motion detection and magnetic field detection! The CAN-BUS Shield provides your Arduino or Redboard with CAN-BUS capabilities and allows you to hack your vehicle. It uses the Microchip MCP2515 CAN controller with the MCP2551 CAN transceiver. CAN connection is via a standard 9-way sub-D for use with OBD-II cable. Ideal for automative CAN application. The shield also has a uSD card holder, serial LCD connector and connector for an EM406 GPS module. These features make this shield ideal for data logging application. 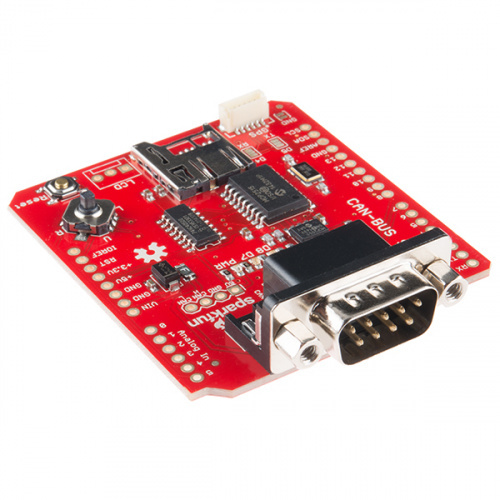 The SparkFun MIDI Shield board gives your Arduino-based device access to the antiquated, but still widely used and well supported MIDI communication protocol, so you can control synthesizers, sequencers, and other musical devices. The MIDI protocol shares many similarities with standard asynchronous serial interfaces, so you can use the UART pins of your Arduino to send and receive MIDI's event messages. Back by popular demand for a limited time! We've finally figured out how to safely ship our Silicon Nitride Igniters. These igniters are used to light natural gas furnaces. Simply apply 12V and they quickly heat up to above 1300°C (that's white hot!) 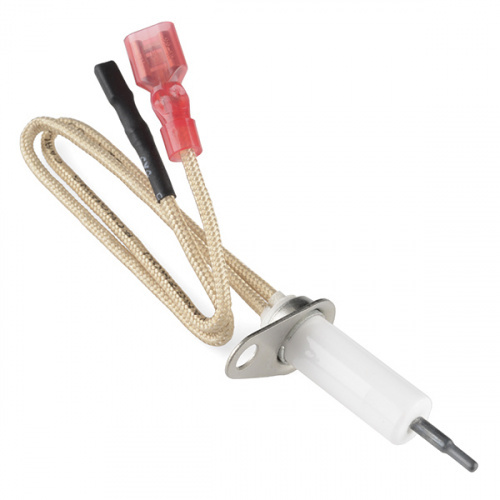 The heating element is cemented into a ceramic insulator and connected to a stainless steel mounting tab. It is important to note that these igniters are heavily controlled and we will NOT be able to ship them outside of the United States. Sorry, world! That's all for now, folks. Thanks for stopping by, and rest assured we will be back next week with yet another Friday Product Post. See you, then! Hurray for the box wall! I would say it meets or exceeds all applicable ISO and ANSI standards. Also, another vote for more shenanigans. One note about CAN, though. It is often mistaken for a differential bus, but in fact it is ground referenced. There are three detectable states on the CAN bus: 0, 1, and collision (0 wins). Can't get away without a ground reference, as in a true differential bus. Good to know, thanks! I honestly thought it was a regular differential pair. I would guess that it has a rather substantial potential to trigger explosives when falling into the hands of rough foreigners who lack the naturally peaceful disposition of Americans. Yeah, not like they can't get them on every street corner "over there." It's nice to see the box wall back, but the SparkFun logo needs to go through its color changing cycle (red/white) like it used to and perhaps add some new colors (if those are RGB LEDs) to better contrast with the red wall. Too soon, bro. Too soon. I think he was being sarcastic. If that is the case, I'm still gonna smack him for asking/forgetting so soon. Yay the box wall is back!!! Woohooo. Is it real or just a green screen trick? Glad to see you fixed the error with the DIN pins on the MIDI board. Any plans to also update the MIDI Breakout board (BOB-09598) as well? PS. I guess the hunt for the last sign LED misfiring is over..... or is it? You have got the box wall, now you are missing Rob!! Love the friday videos, but, we will sure miss you Rob. Do cameos! I do not know why bit it is strangely comforting to see the box wall back. The set in the new building looked a little bit ramshackle IMHO it did not reflect well on the SF brand. Those red boxes just work. Came hoping for CAN bus, started to become disappointed on first 2 products and then was rewarded with red CAN bus. Can there please be a regular amount of shenanigans in the Friday new product posts? Maybe use the Friday new product video as an outlet to inspire the community with project ideas, while also briefly introducing us to the new items?